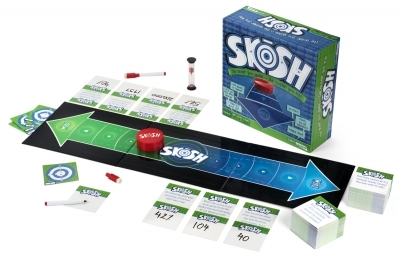 Skōsh is the team-play game that turns traditional trivia on its head. Draw from hundreds of unique — and sometimes off-the-wall — questions, then pool your wits and take your best guess. You might miss the mark, but the closer you get, the quicker you’ll win. Victor or not, conversation will rule the night. It’s free-wheeling fun whether you miss by a mile or win by a Skōsh. Yeah finally a game my older kids will play and its age appropriate!! Super fun and gets great family conversations going. Im learning new things about my kids. So happy with this. A game that is perfect for all levels! How cool to be able to play with a 7 year old up to 17 and everyone helping by giving their best guess. I love this concept, because I find it hard to include all of the different ages in my house in thinking games.